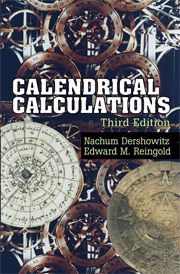 A valuable resource for working programmers, as well as a fount of useful algorithmic tools for computer scientists, this new edition of the popular calendars book expands the treatment of the previous edition to new calendar variants: generic cyclical calendars and astronomical lunar calendars as well as the Korean, Vietnamese, Aztec, and Tibetan calendars. The authors frame the calendars of the world in a completely algorithmic form, allowing easy conversion among these calendars and the determination of secular and religious holidays. LISP code for all the algorithms are available on the Web. 1. Introduction; Part I. Arithmetical Calendars: 2. The Gregorian calendar; 3. The Julian calendar; 4. The Coptic and Ethiopic calendars; 5. The ISO calendar; 6. The Islamic calendar; 7. The Hebrew calendar; 8. The Ecclesiastical calendars; 9. The Old Hindu calendars; 10. The Mayan calendar; 11. The Balinese Pawukon calendar; 12. Generic cyclical calendars; Part II. Astronomical Calendars: 13. Time and astronomy; 14. The Persian calendar; 15. The Baha'i calendar; 16. The French Revolutionary calendar; 17. The Chinese calendar; 18. The modern Hindu calendars ; 19. The Tibetan calendar; 20. Astronomical lunar calendars coda; Part III. Appendices: A. Function, parameter, and constant types; B. Lisp implementation; C. Sample data.